Welcome to 'Paradise at the Palms,' a luxury villa located across the street from the ocean. We have a large open floor plan with a huge kitchen that has 2 refrigerators, granite counters, and 8 leather bar stools. In the dining area, there are 2 pub style dining tables, seating 12. The main floor has an over-sized sectional sofa, 2 cozy chairs and a 55 inch HDTV. The villa has 2 bedrooms on the main floor with 2 bathrooms. The second floor has 6 bedrooms with 3 bathrooms. The second floor has a large den area with two leather sofas and a 55 inch HDTV. The laundry room has a brand new washer and dryer. We have Wi-Fi, a pool, a hot tub, and 5 outdoor grills with a picnic table for our guest to use. All eight bedrooms have been re-floored for 2012. 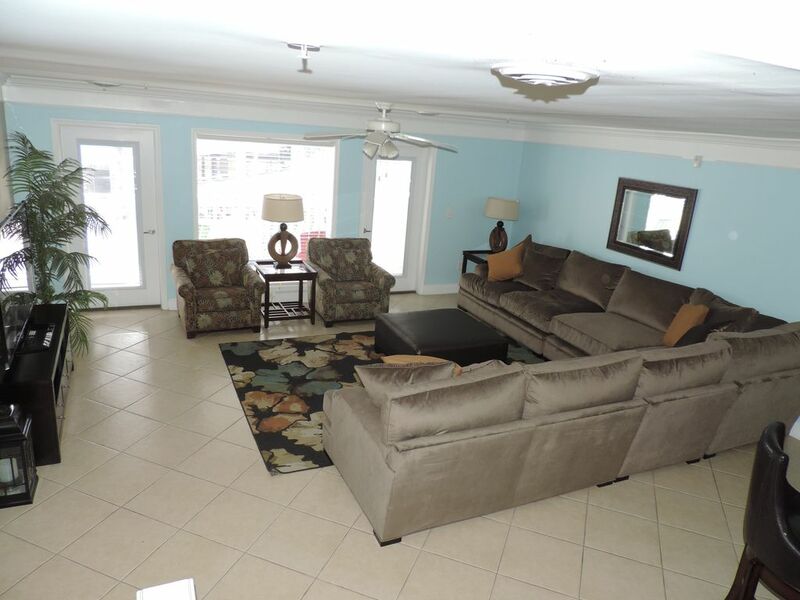 There is a large balcony on both levels with seating to enjoy the views and sounds of Myrtle Beach. ALL BEDROOMS HAVE A BRAND NEW 32' FLAT SCREEN TV!!! PARKING: Parking is on the ground level underneath the building along with the swimming pool and hot tub. The beach access is directly across the street. Unfortunately, our By-Laws do not allow motorcycles or trailers on the premises. 2 levels with 6 bedrooms upstairs and 2 bedrooms downstairs. Two large den areas and balconies on both levels. Pool is for the complex guests. The property was very relaxing that met our family’s needs with space and other amenities. The only reason we did not rate 5 was due to a few roaches in the kitchen , master bedroom, and bathroom. Overall we enjoyed our stay. Great kitchen with everything needed. Beds were made up on arrival and having beach towels provided for use in hot tub was a great touch. VERY easy owners to work with. Thank you for choosing my villa for your beach trip. I truly enjoyed working with your group again this year. Thanks for always taking such good care of the villa. Look forward to your visit next year. This place allowed for a great family get together. We enjoyed the open kitchen/living room area which provided enough space for games and conversation. Easy access to the beach across the street was a plus for running and walking. Some bettter cleaning in the kitchen (dirty coffee pot and microwave cover) and some pillowcases did not appear to be clean. More paper towels and toilet paper would be nice as well but we read the previous reviews and knew to bring enough for the family. I also did not bring a hair dryer assuming there would be one at the place. Overall, we would probably would rent this place again. This Villa was more than we expected. The size of all the bedrooms, kitchen and baths were great. All appliances, kitchenware, along with the extra beach towels and beach chairs were a plus. We had plenty of space to be with or without all 15 members of our family in the same areas. Beautiful décor. If we come to the beach again next year will look for this Villa. availability. Lori Hughes was very helpful at all times and answered all my questions promptly. Thank you for your kind words and writing a review. This helps other travelers looking for a place for their family. You were a pleasure to work with and are welcome back anytime. Villa was great. Very clean and spacious. Would stay there again. Perfect for our party of 19. Plenty of space. Everything that you need in the kitchen . Double refrigerators came in very handy. Neat, clean, beach towels, buggy, chairs enough for all. Couldn’t ask for more. Thank you. I am so glad your family enjoyed the villa and your beach trip. Thank you for the review and for speaking so kindly about my villa. I want all families to have everything they need and not have to worry about anything. We want our guests to be stress free and have lots of fun and good family fellowship. Paradise at the Palms is located in North Myrtle Beach. It is a great location for families as well as golfers. We are close to the park, Krispy Kreme is located at the end of the road, we are close to Main Street with all the local restaurants. Barefoot landing is minutes away offering the House of Blues, Alligator Adventure, and many shops and restaurants. We are very close to the Inlets to the Ocean so there is easy access to fishing, boating, jet ski rentals etc. A short walk down to 17th Ave. South offers parasailing and banana boat rides. The area offers many championship golf courses, restaurants, and the Tanger Outlets for shopping. We are close to the Bass Pro Shop and newly remodeled theaters at Colonial Mall. Call Owner For Details Check out my 4-Bedroom Villa on Home Away listing # 914540. My properties are called 'PARADISE AT THE PALMS' 1 and 2.